The use of personal surfaces, such as smartphones or tablets, in conjunction with a shared surface, such as a digital tabletop, enables the use of private, secure, or proprietary data during a group situation. At present, moving information between digital tabletops and such peripheral devices tends to be cumbersome, often interfering with the task or activity at hand by capturing the attention of the person initiating the information transfer. This project aims to improve this information transfer experience to enable people to remain engaged in the ongoing group activity. 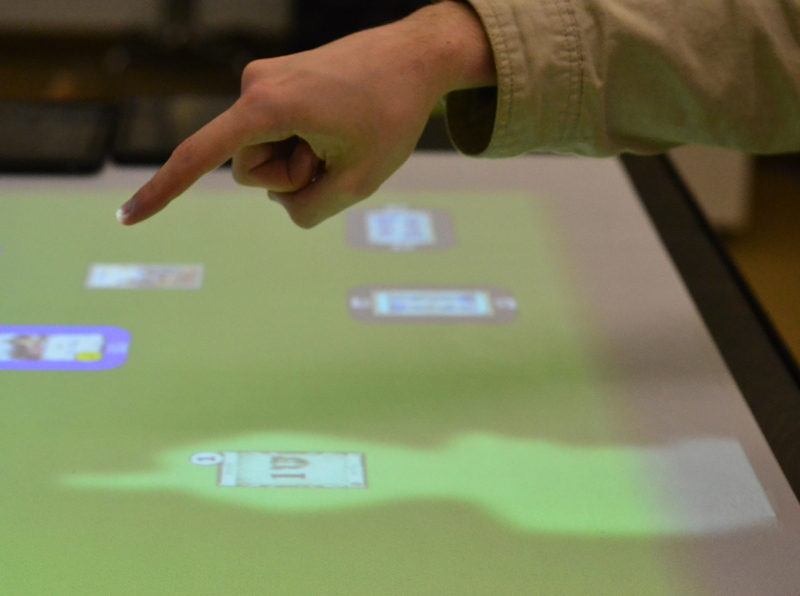 The main idea being investigated in this project is to track the user during a Pick-and-Drop-style (Rekimoto, 1997) transfer action between the peripheral device and the digital tabletop and provide visual feedback on the digital tabletop surface. This feedback depicts the information that is in transit between devices as an artifact “held” in the hand of the transferee, moving in real-time below the user’s hand until the artifact is released. This project builds on the previous SurfNet project, UbiCursor, in that it focuses on providing people awareness information when information is “between” displays (i.e. in the “ether”). To investigate the proposed design concept, a case study of a digital tabletop game was undertaken. 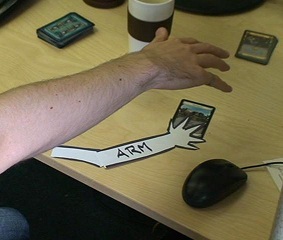 The commercial card-based game Dominion was implemented in a digital tabletop application (with permission of the game publisher Rio Grande Games) and several proposed content transfer techniques were evaluated over several iterative studies (see associated papers on this project page). The game Dominion was chosen as it requires players to hold private hands of cards, as well as to share decks of cards with other players, typically on a table. The main project results were that providing device-appropriate visual awareness cues enhances the usability of cross-device transfer interaction. The most effective techniques we implemented required above-the-table tracking sensors external to the table capable of distinguishing between different tabletop users (see Surface Ghosts – Scott et al. ITS 2014). However, our results suggest that it may be possible to provide improved awareness during transfer by using less sophisticated user tracking techniques, such as proximity sensing. When no user sensing is possible, we also found using a straightforward “virtual portal” approach, where each connected device has a dedicated interface container through which content can be passed (see Scott et al. CTS 2014). Initial Design Concept (left) and Implemented Surface Ghost visual feedback (right). tabletops that cannot distinguish between multiple tabletop users. Scott, S.D., Besacier, G., Tournet, J., Goyal, N., Haller, M. (2014). Surface Ghosts: Promoting Awareness of Transferred Objects during Pick-and-Drop Transfer in Multi-Surface Environments. Proceedings of ITS 2014: ACM Conference on Interactive Tabletops and Surfaces, November 16-19, 2014, Dresden, Germany. Julie Tournet, Guillaume Besacier, Nippun Goyal, Phillip J. McClelland, and Stacey D. Scott. 2013. Comparing visual feedback techniques for object transfer between private and shared surfaces. In Proceedings of the 2013 ACM international conference on Interactive tabletops and surfaces (ITS ’13). ACM, New York, NY, USA, 377-380. McClelland, Phillip J. (2013). Bridging Private and Shared Interaction Surfaces in Collocated Groupware. M.A.Sc. Thesis, Systems Design Engineering, University of Waterloo, Waterloo, Ontario, Canada. Stacey Scott, Phillip McClelland, and Guillaume Besacier. 2012. Bridging private and shared interaction surfaces in co-located group settings. In Proceedings of the 2012 ACM international conference on Interactive tabletops and surfaces (ITS ’12). ACM, New York, NY, USA, 403-406.